Dandy (to me anyway) on the Way..
Ok so I acquire different straight razors for different reasons. Most of the time I desire them because I believe they will be good shavers and I like them aesthetically but sometimes I get them for different reasons. Sometimes I get the due to where they were made. I live in the Philadelphia area so I recently picked up a Vintage Straight made by a Shear Company based in Philadelphia. Philadelphia is stamped on the razor. 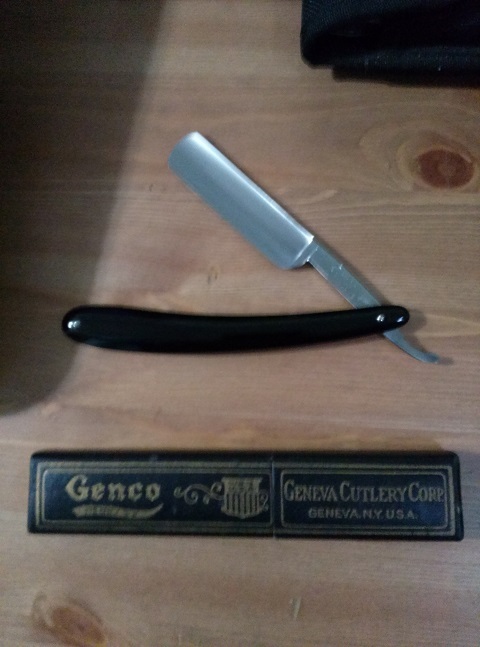 Another one I have obtained, which happens to be very attractive as well, was made in Allentown, Pa and some Case straights are out of Bradford, Pa.
As far as American Razor Makers I think Case and Geneva Cutlery are my 2 personal favorites. This brings me to the razor I am so excited is on its way. It is a Genco Henry X 6/8" Straight that is in as close to mint condition or NOS of any straight I have ever had. Even the box is in mint condition. This looks like it was purchased and sealed away. I am really excited to shave with it and use it, but I will be honest, this one I am just glad to have for my collection. It is not particularly valuable, not particularly rare, but it will be my finest condition example of a Vintage American Straight that I have. It should be here by weeks end. I will post pics when it arrives. I look forward to seeing/hearing more about this new find, Jim. (04-29-2014, 09:01 AM)Agravic Wrote: I look forward to seeing/hearing more about this new find, Jim. Thank You Ravi. I have this and a 6/8" SR Dresher on the way and I done buying straights till I have the time to get the ones I currently have in order to be shaved with. Anyway I am particularly excited about this one. I do not think it will disappoint. I have dealt with this gentleman before and when he describes a razor it arrives dead on. He also often sells them as shave ready and when you get them they truly are. Literally wipe off the mineral oil and shave. I had a pretty good collection of Geneva's at one time. I sold all but 2 or 3 Pyramid 7's. I regret it now. There where some excellent shaving U.S. razors on the market. Enjoy your new razor. I live an hour or so north of Phila. Around here Gencos and Geneva's fall out of the woodwork. I also collect blades stamped Pa. In one form or another. Unions are another brand from the NY area I gravitate towards. I also have razors made in Allentown Pa. a neighboring city where I grew up. There was a cutlery firm there at one time called Wolfertz . Just neat having local stuff. (04-30-2014, 08:17 AM)mycarver Wrote: I live an hour or so north of Phila. Around here Gencos and Geneva's fall out of the woodwork. I also collect blades stamped Pa. In one form or another. I totally agree re local stuff. Im pretty excited to get that International Shear Co Staight made in Phila. cleaned up. Here is the Genco which arrived today. I was lucky I happened to be home as I have a Dr's appointment!